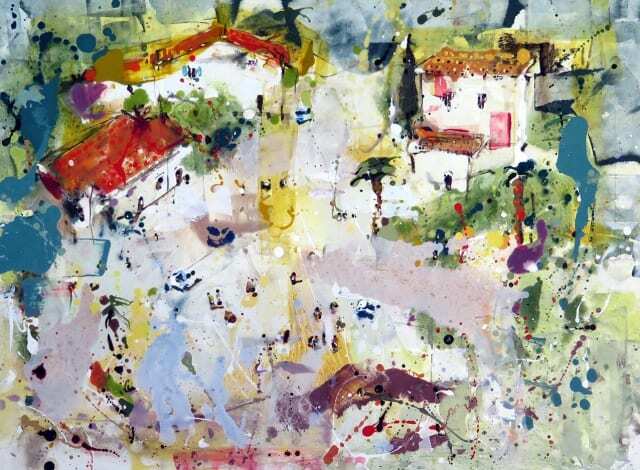 Making several trips abroad each year, Andrew's paintings are born from detailed, lively sketches he makes 'on location'. Bustling cities in destinations like India, Morocco, Italy and France all lend themselves well to Andrew's animated, expressive mark-making style. It is his aim for the viewer to see beyond a picturesque location as he captures an elemental energy of time and place. Spending at least a week making drawings, recording not only details of buildings and people, but absorbing the atmosphere of a particular place will allow him to build a real experience for the viewer. His paintings not only communicate light and shade but it's possible to have an understanding of the temperature, sound and scents. He will often seek out a high-up view point in order to see the liveliness of a particular place, observing the hum of the people, traffic and changing light. Once back in the studio, working from his gathered drawings, Andrew will surround himself with paint, and by quickly pouring, scraping marks on the canvas, he builds a painting that is like his sketches, vibrant and alive with movement. His paintings will go through several lives, being worked and re-worked in order to bring through the depth, texture and luminosity.